Unfortunately The Dodo's suffered recently with the loss of guitarist Chris Reimer who had a flair for coloring the bands sound with noise-rock. Carrier has splashes of the artsy playing Reimer loved but is strictly an indie-pop positive send off for a friend and an engaging listen for the rest of us. Meric Long and Logan Kroeber begin the disk on a mellow note playing with sound as "Transformer" swirls before the bands ear catching percussive tendencies come out on "Substance". The band was founded on rhythm and while not as frantic as past efforts Carrier continues the trend of engaging rhythmic pattern even without a bass being present. The pop touches with cool drumming continues on "Confidence" as the Long picks out a pattern behind his mellow singing of the title phrase before the pedal gets put down half way through the track amping the tempo. The guitars swing around each other as the tension rises, drumming remains choppy and moving as things soar. Tracks like "Stranger", "Destroyer" and "Relief" continue this trend of keeping things straight ahead before augmenting slightly with phrases, instrumentation or production slightly out of the norm. "Family" has some engaging lyrics and guitar lines from Long that shine while "Death" seems light and wispy, far from cold and final. Along those lines, "The Current" seems to be hinting at something larger behind the surface but never gets there, pretty in the moment but not long lasting or exhilarating. 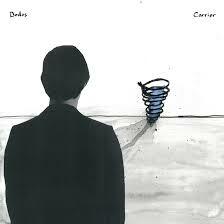 Overall, Carrier is indie pop pretty with enough engaging musical textures that things float around your ear amicably. Cool band, caught them on Letterman the other night, The Dodo's are solid live, while Carrier is good it never reaches at the heights hinted at in the disk or from the bands live playing. Need to catch them soon, as in all bands like this adding a bass would def help the sound in RtBE's opinion. New Pearl Jam Tune with Video: "Sirens"
Dylan Cover #104 Francesca Bavaro "Wedding Song"
New Lee Ranaldo Tune, Album Due Next Month.